Following a slight bump in EU Composite PMI this morning, US Composite PMI dipped in June (preliminary) data driven by a slump in manufacturing. 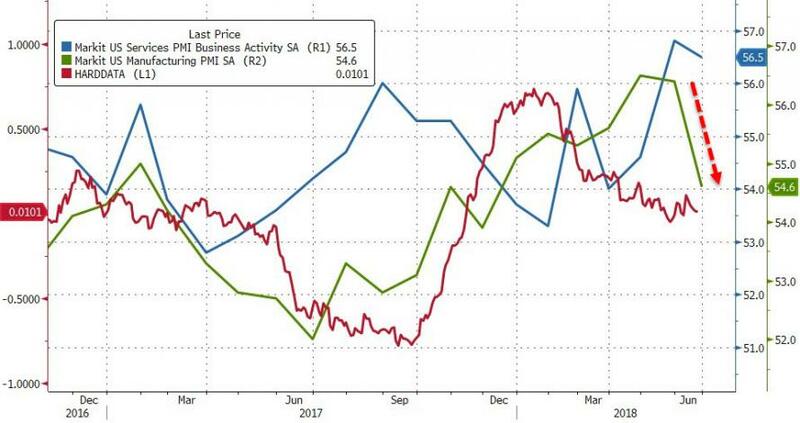 While Services PMI slipped lower, Manufacturing plunged to its weakest since Nov 2017. More worrisome is that Stagflation is here - New Orders tumbled to the lowest since September and inflation spiking with input costs at their highest since Sept 2013. “Price pressures remain elevated, however, widely blamed on a mix of rising fuel prices and tariff-related price hikes, as well as supplier’s gaining pricing power as demand outstrips supply for many inputs. “Risks are tilted to the downside for coming months. Business expectations about the year ahead have dropped to a five month low, led by the weakest degree of optimism for nearly one and a half years in manufacturing. 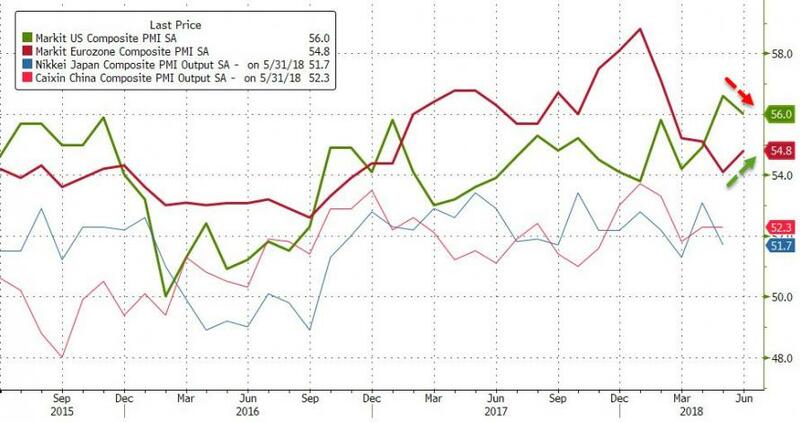 Exports are back in decline, showing the worst performance for over two years, causing factory order book growth to slump sharply lower compared to earlier in the year. So surging prices are crushing orders and production is continuing to ignore it.. for now. That won't end well.